Many businesses use Twitter to promote themselves and also to engage with their followers. If used properly, this can be very effective in obtaining new business, getting more visitors to their site and in promoting brand. There are still businesses out there who are not harnessing the power of social media and who will miss out. If you are one of these and are not sure about taking the plunge, what are you waiting for? You do not need to spend all day on Twitter, if that is one of your concerns, set aside a little time each day and engage with your followers. So, what is Twitter and how do you go about using it in such a way as to make it work for your business? The most basic description of Twitter is that it’s a service that allows users to update what they’re doing in 140-character, bite-size messages that are broadcast to their group of followers. As a Twitter user, you can follow people to get their status updates (“tweets”) and others can follow you to get your updates. It’s really that simple. Sort of. Read on for more details. A grasp of Twitter terminology is vital to anyone using the service. There are a lot of terms unique to Twitter, and it can get very confusing, very fast if you don’t have some idea of what others are talking about. Here’s a quick guide to the most common terms you’ll likely hear. DM or Direct Message: This is a private message sent to another Twitter user. It’s preceeded by a “D” and can only be sent to a user who is following you. Hashtag: Hashtags are single-word phrases used to organize different topics, chats, and events on Twitter, and are preceeded by a hash mark “#”. 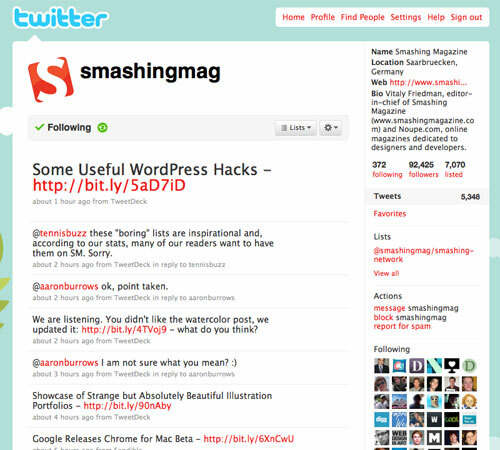 Lists: Lists are a fairly new Twitter feature, and are just what they sound like: lists of Twitter users created and categorized by other Twitter users. You can follow entire lists rather than having to follow each individual user. Reply or @reply: To reply to another Twitter user, or include them in a tweet, you put an @ symbol before their username. If the @symbol is the first character in the tweet, the reply will be shown to them and anyone following both of you. If the @ symbol is not the first character, then the tweet will be shown to all of your followers, plus the person whose username follows the @. RT or Retweet: Retweets are re-broadcasts of another user’s tweet. This is traditionally done by including an “RT” before the original poster’s @username. This has long been an unofficial feature of Twitter, though Twitter has recently added official support for it. Some users use other characters (such as a full stop “.”) for brevity’s sake. Trending Topics: These are the most popular terms appearing on Twitter at any given time and may include hashtags. Google make changes to results in the USA - Is it bad news? Making Google Panda EXTINCT in 2012 by using the Right Content! Social media as part of your online marketing strategy Has your website been affected by the Phantom?